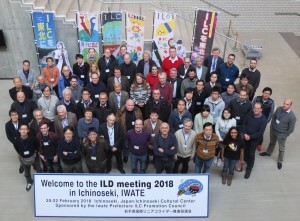 Participants pose in front of ILC support banners in the ILD meeting venue. Scientists working in large international collaborations are used to travelling the world and seeing new places. But scientists travelling to Kitakami in northern Japan, the area where the ILC would likely get built if it is approved, tend to return with one prominent tale to tell: that of the support of the local public. ILC banners on town halls, ILC flags in shopping street, road signs and knowledgeable citizens speak volumes about how keen the area is to host the ILC, and they get noticed. 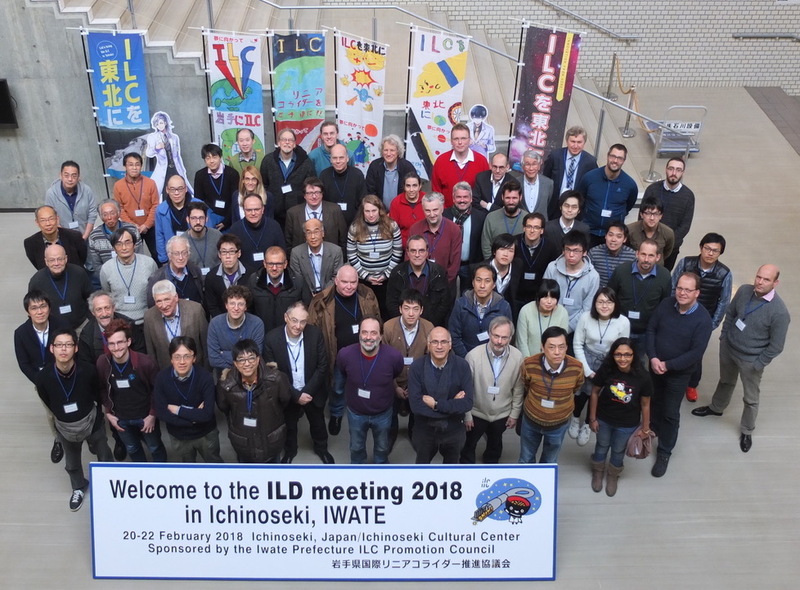 “It’s great to see all the enthusiasm in and around Ichinoseki,” says Ties Behnke, ILD spokesman and scientist from the German lab DESY. “The mayor density at the official parts of the meeting was extremely high as well. The ILD meeting consisted of several parts and lasted a week in total: from software and analysis pre-meetings via the official core ILD meeting to a concluding infrastructure meeting. A total of 64 participants from some six countries came together to hear about and discuss ILD and ILC status and development. Detector developers are always on the hunt for novel technologies and ideas that could make their system even more precise, fast or cost-optimised. Generally, the ILD detector has been designed to give the best possible and most complete picture of any particle created in the electron-positron collisions. The unique particle flow algorithm identifies and traces each particle from its creation to the point where it decays or leaves the detector, complete with all information about its momentum and its path. So far, so good. But people are always looking for improvements or new ways of making the picture even more complete. In his talk about the tracking detectors, interlaced with questions such as “Is our tracker sufficiently aware of new developents?”, Marcel Vos from the Spanish insitute IFIC suggests looking at four-dimensional tracking, integrating timing with excellent resolution from the very beginning. According to the tracking experts, it looks promising and should be watched, “but it is not quite at the specifications yet,” says Behnke. Vos also discussed how new developments in the in the world of cooling and support structures could make ILD significantly better. Precision timing indeed might be an area where major advances in the ILD concept might happen. Calorimeter developers are also looking at ways to integrate the information when a particle was where, and while ILD does an excellent job in creating a complete spatial image of each collision there are new technologies on the horizon that could potentially change the way by adding precise timing information. As Felix Sefkow points out in his talk, the ILC detector technologies and ideas are 15 younger than the LHC detectors ­– but they are also 10 years older than the plans for the upgrades of the LHC detector for high-luminostity operation. “Are we still good enough?” adds LAL’s Roman Pöschl in his talk, and presents a few ideas that could tackle the timing problem. Collaborations and projects can learn a lot from each other, and the experts will go into detailed exchange with colleagues. The field is rapidly advancing, and ILD is eagerly watching the developments to find the most fitting solution. While considering these rather exciting possibilities, ILD experts also have a concrete goal: by the end of the year, they plan to deliver a short report as input for the European Strategy for Particle Physics. Early in 2019 this will be followed by a full ILD report.